Oh. My. Goodness. Made this last night for friends and they were incredibly impressed (as was I). I haven’t eaten pizza for years and boy did I miss it! My only complaint was that I doubled the recipe with the intention of freezing one of the pizza’s as suggested but my company and I gobbled up both! I also attempted to load a little too many veggie toppings which made the pieces a little soggy so next time I’ll go easy on the toppings and pair the pizza with a big raw salad instead. I used daiya cheese instead of chevre and it turned out beautifully…. crispy, delicious and very bread-like. I was wondering if I might be able to make actual “bread” slices by shaping the dough into bread slice shapes and making it a little thicker so I might use it to make sandwiches… have you tried this? My only advice to those who haven’t tried this amazing recipe yet is to make sure you plan ahead! I had to wait forever for my cauliflower rice to cool down before I could squeeze out the moisture so we ended up eating pretty late but next time I’ll just make it ahead of time. Definitely try this recipe, I’m pretty sure my life will never be the same! This recipe is amazing! I love it…my husband loves it! I’ve tried other recipes and had decided I would not try again. So happy I found yours. Thanks Megan for a great recipe! Love the photos too. Would parsnips instead of cauliflower work? I’m intolerant to cauliflower and looking for alternatives. I did make this crust with cauliflower before and it was perfect consistency, only it doesn’t get along with my body even after all that baking. Hmmm… I bet they would! It would probably effect the flavor, but if you like the taste of parsnips, then I say go for it! 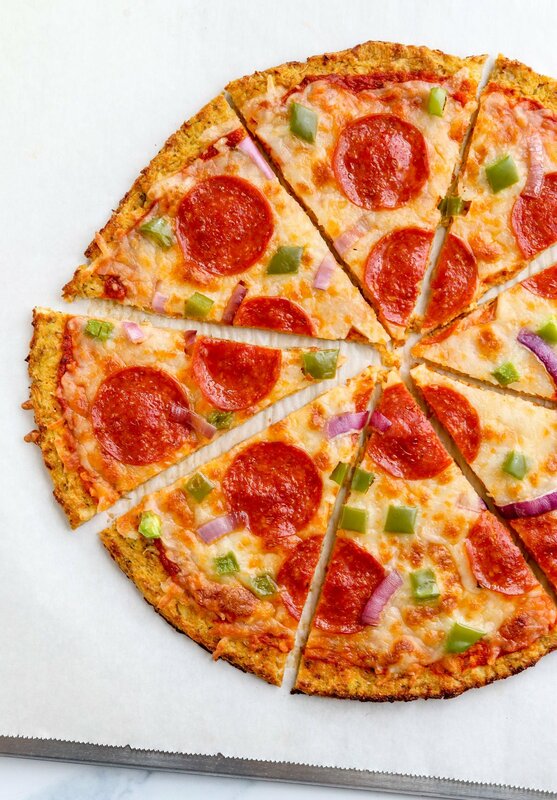 This was the first cauliflower crust recipe I’ve ever tried and it was honestly fantastic. I really enjoyed it. Thanks so much! 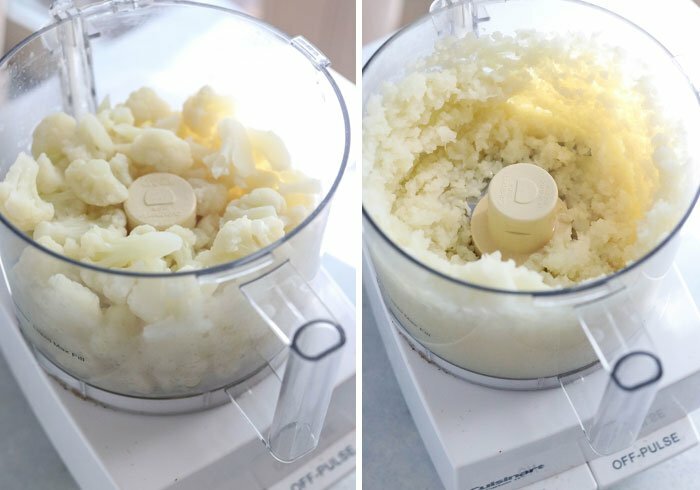 Question: I’ve used a recipe for cauliflower mash where instead of boiling the cauliflower in water you microwave it to take the water out of it. Do you think this might work to help expel water from the cauli-rice needed for your pizza crust? I ask because squeezing the water out of the cauli-rice when I made your recipe was messy and actually pretty strenuous. And, it required me to let the cuali-rice sit a long time to cool (otherwise even wrapped in a towel it was too hot to handle). Hi Kate! I don’t own a microwave, so I can’t test this theory… but please let me know if you have any success! OK. I am excited to try this recipe. I cannot have eggs so used flax “eggs” instead. Also I read somewhere about microwaving the riced cauliflower. I simply put the riced cauliflower into a covered microwave-safe glass dish (adding NO water). It came out great, nice and dry. No need to squeeze out water! I haven’t eaten the crust yet but it cooked up great and looks wonderful. Any ideas what I can use for a binder other than egg? 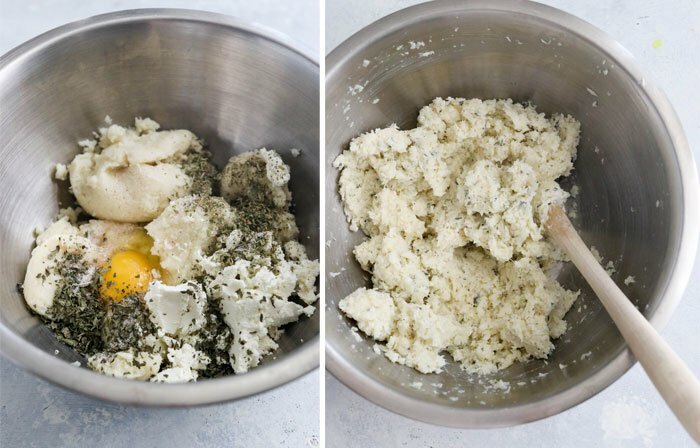 (I can’t have egg, soy, gluten) I have used flax “eggs” for an egg replacer but don’t know if it will be a good enough “glue” to hold the cauliflower together. Great recipe! Made this yesterday and had some leftover cauliflower so I made another one but this time I didn’t cook the cauliflower. I figured it would cook in the oven. It came out great and saved me some time. Hey! this recipe looks awesome! i was just wondering, could you use broccoli to do that too? Yes, I’ve made it with broccoli, and it’s delicious! can i replace the egg with a flax egg and mozzerella cheese instead? I haven’t tried the flax egg yet, but it’s definitely worth a shot! The mozzarella cheese should work fine, too. Thank you for a great recipe. I have made this a few times and have come up with a slight variation that is a huge hit in our home. I posted the recipe and shared the linky love. 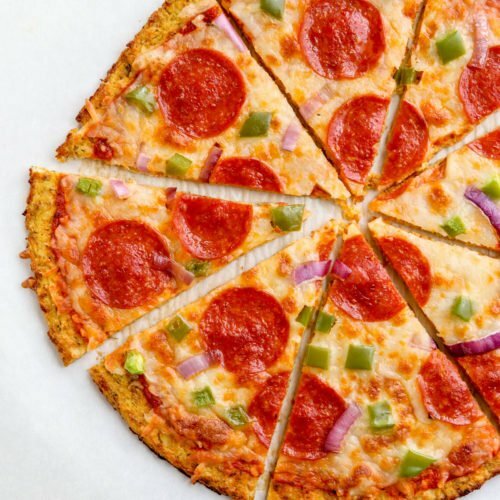 I hope that you’ll check it out: Cauliflower Crust Pizza on Cook Lisa Cook. I made this tonight and it was amaaaaazing! Thank you so much for posting the recipe! Instead of using goat cheese, I used mozzarella. I don’t think I’ve ever had goat cheese and was just curious if you recommend goat cheese over “regular” (cow) cheese (and if so, why). I’m fascinated by this blog! I’ve never really heard of food combining. I’m intrigued! hi, I’ve been looking at making this recipe, but I’m highly lactose intolerant. What would you suggest as a substitution for the chevre in the crust? Also, I was planning on using “follow your heart” cheese, but if you have a suggestion there, I’d love it as well. i meant what would you use instead of the chevre? Yes, that’s what I was referring to. 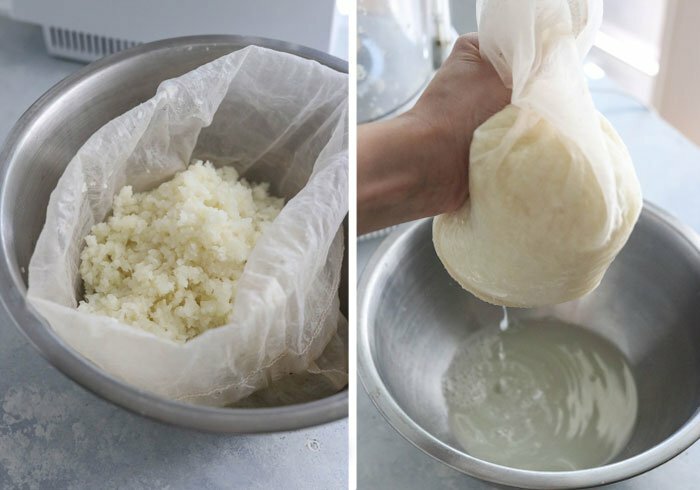 A cheese-substitute that melts would replace the chevre and act as a binder in the crust. Thank You, and I definetly will…another thing, would the recipe still work if a used a cheese substitute, like vegetarian cheese to hold it together? I know one of the previous commenters used yogurt., but I just want to be sure so I dont mess up. 🙂 Thanks Bunches! Hello , does the cauliflower have to be raw and fresh to turn it into “rice” or does it turn into rice even if you use frozen cauliflower? I’m off to the store…how many heads of cauliflower do I need to buy??? 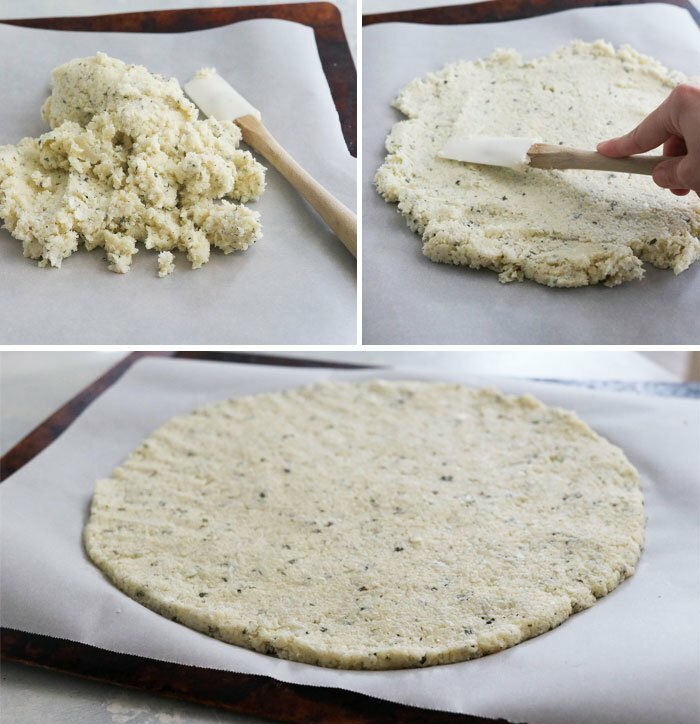 I used one large head of cauliflower to create one large crust, or two personal-sized crusts. Oh! 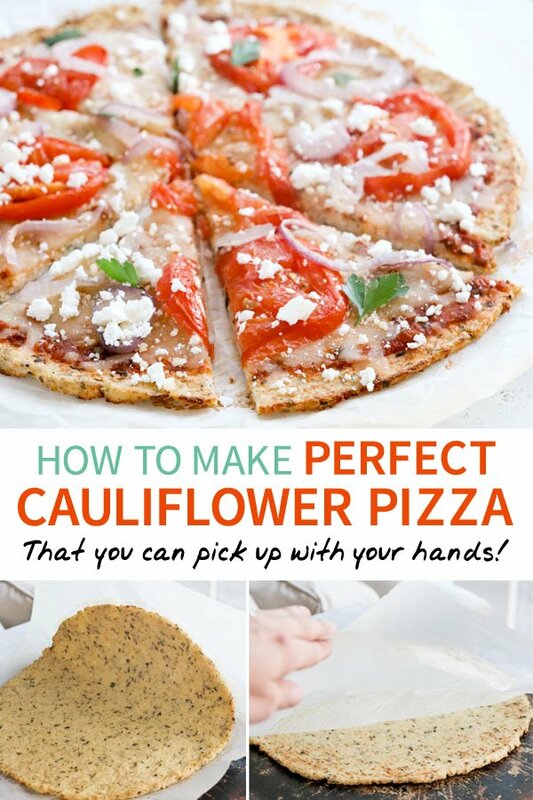 I’ve made cauliflower pizzas twice now and although they were both delicious, I didn’t think about baking the crust before the toppings… Can’t wait to try it out! My very Italian boyfriend actually loves these, so needless to say anybody slightly hesitant should go for it! This pizza crust was AWESOME! All day I was thinking about making my pizza-but figured I would Google the crust recipe and the one I was using did not come up at all. YOURS did. I went out and bought all of the ingredients, rep pepper, onion and some fresh baby Bellas. OMG-it was the absolute best. I am making it for company this weekend. Thank you SO much for sharing this recipe. Being 100% Italian, pizza MUST be a staple in my diet. Now, it can be-Healthy! After reading this recipe (which I plan to try), I happened to be making cauliflower mashed potatoes, so I wrung out my cauliflower for that, too. It made a huge difference- much more like mashed potatoes! I’ve made this, but with raw “riced” cauliflower and part skim shredded mozzarella as the base and it was really good! My only issue was it sticking to the pan, but (duh) parchment paper solves that issue. Rachel, did you find that using raw “riced” cauliflower worked just as well as using steamed riced cauliflower? I would like to omit unnecessary steps. I considered steaming & then using my Vitamix…or using my Vitamix & then steaming…BUT would much rather use raw riced cauliflower. OH. MY. GOD. MEGAN!!!! It works! It works! We made this last night and it held together AND was crispy!!! I made mine a tad thicker than my daughter made hers, but each had wonderful qualities that we will be sure to repeat again 😉 Thank you for sharing this with me; you’ve brought pizza back into my “bariatric” life! Note to self: Find the box containing the food processor in the garage; ricing two heads of cauliflower by hand costs too much in knuckle-flesh…;-) Have a great day! Just made my 1st pizza with the recipe!! Loved that it’s crisp enough to pick up!! I missed the comment about measuring the cauliflower after steaming and draining it, so my pizza was a lot smaller than yours, but still yummy!!! Thanks! Thank you, Sue! Good to know that it works well without the cheese, too! I’ll have to try using my Silpat again next time! My 5 year old son and I made this, and we did not add cheese, and we did cook in a silicone pan. My son said it was soooooooooooo delicious. It was indeed dry and firm and tasty. So all systems go!!! I’ve made this a few times, and always get perplexed on the measuring of the cauliflower rice-is this before or after steaming and wringing? 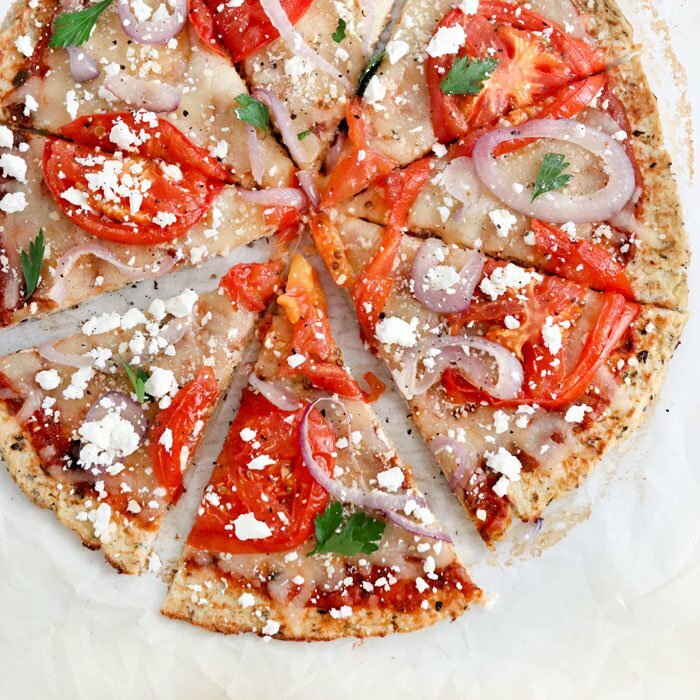 We love this pizza-even our nonpaleo adult kids! thank you! I measured the 4 cups AFTER steaming and draining the rice, but BEFORE wringing it out. The amount reduces even more after removing all that extra moisture! Thank you so much for this recipe – have the crust in my oven now & it smells amazing! That being said, I LOVE your recipes and many are on regular rotation – thank you so much!!! Thank you very much for posting this clarification! I’ve made this recipe twice, and measured the four cups *raw*. Needless to say, I ended up with barely a cup of cooked/strained cauliflower. What’s so great about this recipe is it’s really forgiving: when I saw I wanted to try it right away, but, except for the egg and the seasonings, I had none of the ingredients. So, I used broccoli and zucchini “rice” and blended cheddar with plain yoghurt as the cheese. Since it didn’t have any strong character without the chevre, I threw in a teaspoon of miso, a clove of garlic, and some black pepper to compensate. I just used a simple topping of chopped red bell pepper. And it was delicious! Thank you so so much! If I don’t have parchment paper, has anyone used nonstick spray or foil?? 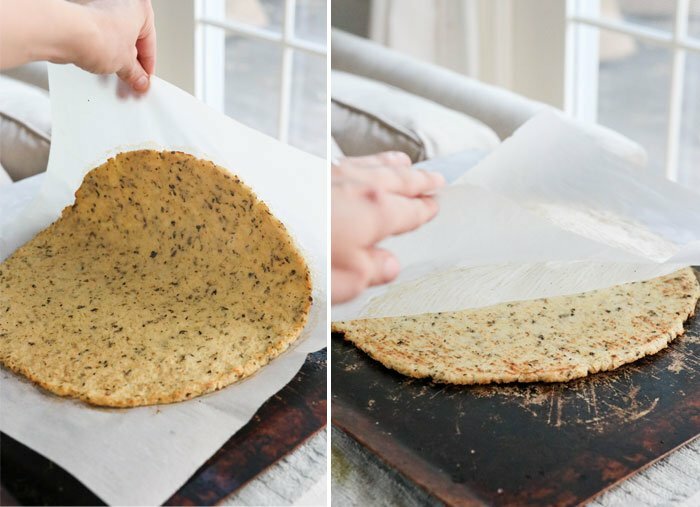 I’ve tried baking it on a Silpat, which usually has similar results to using non-stick spray, and the crust wasn’t as dry or firm as when using the parchment paper. Please let us all know if you have any luck, though! Hi Megan. I made your Cauliflower Fried Rice two nights ago and your Cauliflower Pizza Crust for dinner tonight and both were SO good, particularly the pizza. My husband loved it! I made all the cauliflower rice a couple of days ago and kept it covered in the fridge so it was a lot simpler and quicker to make make both dishes. I even whipped up some more of the fried rice for lunch today! Thanks for some amazing recipes! this crust was great. i was not expecting to like it but I really did!!! My daughter followed the recipe exactly and the crust was easy to pick up, crisp, and I would not have known that it was cauliflower had she not told me. we are going to make it when we get home for sure. you must wring out the moisture after the cooked cauliflower cools some. Hi, Megan. My younger daughter was recently diagnosed with gluten and casein intolerance, so for now we steer clear off any milk products, including goat milk (it has a diferrent form of casein, but during the “cleansing” period none of it is allowed). So, my question to you – can i make the same crust but skip the cheese altogether? DO you recommend any alternatives? Is it just for flafor, or it actually keeps the thing together? I haven’t tried making this without the cheese yet, so I can’t say for sure how it will turn out. I think if you reduce the cauliflower a bit, and just use the egg, it should turn out fine… but you just never know until you try. If food combining isn’t an issue for you, perhaps adding a tablespoon of ground flax would help bind it together as well. My rice was still mush the second time around, and still didn’t look like yours, but I decided to proceed anyway, and I’m glad I did because it worked! It held together just fine and could easily be picked up to eat, we did not use any utensils. We topped it with sauce, mushrooms, onions, spinach, chili pepper flakes, parmesan, mozza, and fresh basil. Yay, I’m so glad it worked for you!! I was surprised at how tasty this was! Truly a keeper in the recipe book. The texture, flavor and look was all similar to pizza! I cannot wait to make this again. Wow. Thanks for the recipe! So glad you enjoyed it, Tiffany! since you have had 51 comments to date, and no one has asked for clarification, i must be asking a question that needs none. however, i am unsure about the steaming of the cauliflower…you said boil the water, put the cauliflower in, and cover and steam for 4 to 5 minutes. does that mean you let it boil on high, or does that mean you cover it and turn it off to steam??? what is the desired doneness of the cauliflower at the end of the 4 to 5 minutes. thank you for enlightening me. i appreciate it. i did not think you wanted it to continue to boil covered, because, one, i did not think that meant steaming, and two, i thought it might burn. so what do i do now…can i salvage the cauliflower? put it back on and cook it a little longer? i know this is not rocket science, but i wanted to do it the way you did, at least for the first time. thanks for your patience with this neophyte cook. If you brought the water to a boil, added the “rice” and covered for 5 minutes, it should be steamed properly– even if you turned off the heat. Next time I make it myself, I will probably reduce the heat to a gentle simmer, rather than keeping it boiling, because I don’t think it’s necessary. Any chance the boiling step can be skipped entirely? Seems baking in the oven would cook the riced cauliflower and not introduce more water? Has anyone tried this? The cauliflower needs to be cooked in order to release enough water. 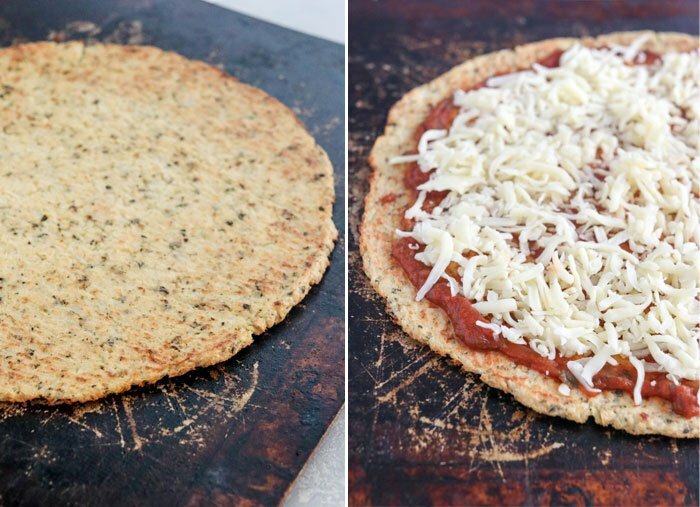 You can make it with “raw” cauliflower rice, but then the baked crust will be soggy. Did you cook the cauliflower “rice” right in the 1″ of water? or in a steamer basket in the water? Yes, I cooked the rice directly in the 1″ of boiling water– no steam basket. I drained it all into a fine mesh strainer after cooking, before transferring it to the dishtowel to squeeze out the rest of the moisture. 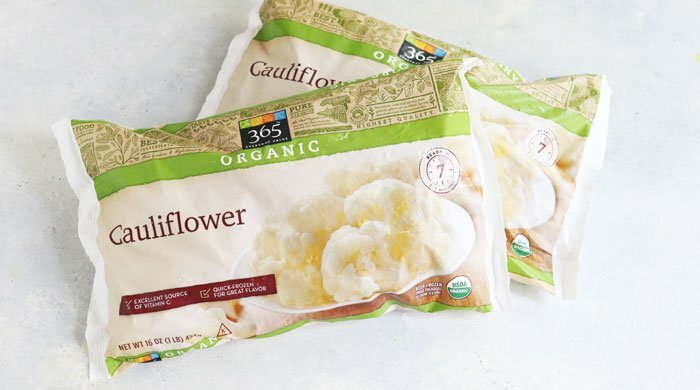 Could I use frozen cauliflower? Has anyone tried it before that way?